It isn’t tomato season yet where I live, but sometimes I prefer good, canned tomatoes over fresh. And this is one of those times that canned tomatoes are superior to fresh in a recipe. This recipe comes from a book entitled, The Best of Bugialli, by none other than Giuliano Bugialli. Even if I never used any of the other recipes in this book, which I have, I’d keep this book just for this one recipe – Torta Di Pomodoro – translated to tomato tart. It’s actually one dish that daughter number 2 asks for on occasion, which always makes me happy. Mostly because I’m thrilled to oblige, but also because I love it too. What’s not to love? It’s tomatoes in a pie crust. But it’s different than other tomato tarts I’ve come across in my many years of reading recipes. So here it is. It’s a very long recipe because one part is the crust, and the other part the filling. But it’s honestly a very simple, straight forward recipe. You can make the crust and the filling the day before. I’m typing the recipe as it is in the book, and then following it I will add my five cents’ worth. Prepare the crust: Sift the flour onto a board and arrange it in a mound. Cut the butter into pieces and place over the mound. Use a metal dough scraper to incorporate the butter into the flour, adding the water 1 tablespoon at a time and seasoning with the salt and nutmeg. When all the water is used up, a ball of dough should be formed. Place the ball in a dampened cotton dish towel and refrigerate for at least 2 hours before using. Prepare the filling: Coarsely chop the celery, carrot, onion, garlic, parsley and basil all together on a board. If using fresh tomatoes, cut them into large pieces. Place the fresh or canned tomatoes in a non-reactive casserole, then arrange all the prepared vegetables over the tomatoes. Pour the olive oil on top. Cover the casserole, set it over medium heat, and cook for about 1 hour, without stirring, shaking the casserole often to be sure the tomatoes do not stick to the bottom. Pass the contents of the casserole through a food mill, using the disc with the smallest holes, into a second casserole. Add the butter and season with salt and pepper. Place the casserole over medium heat and let the mixture reduce for 15 minutes more, or until a rather thick sauce forms. Transfer the sauce to a crockery or glass bowl and let cool completely. 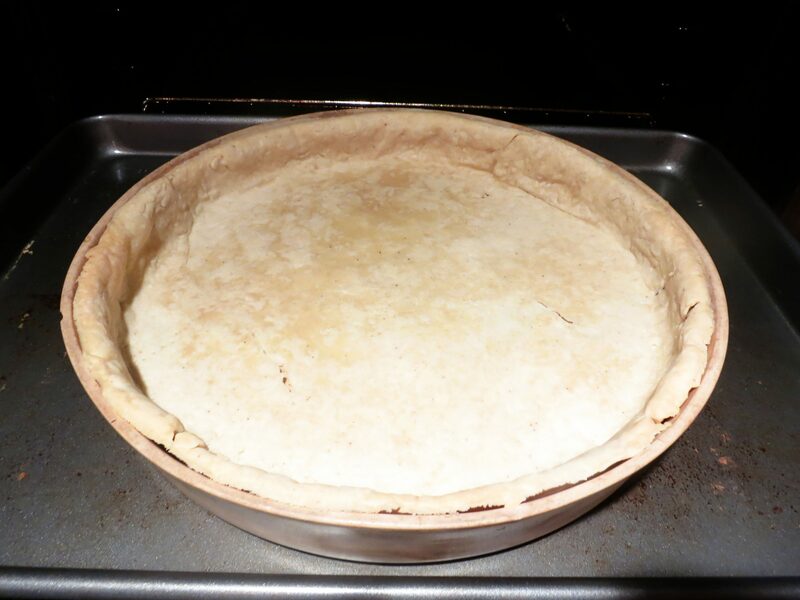 Butter a 9 1/2″ tart pan with a removable bottom. Flour a pastry board. Unwrap the pastry and knead it for about 30 seconds on the board, then use a rolling pin to roll out the dough into a 14″ disc. Roll up the disc on the rolling pin and unroll it over the buttered pan. Gently press the dough into the bottom and up the sides of the pan. Cut off the dough around the rim of the pan by moving the rolling pin over it. Using a fork, make several punctures in the pastry to keep it from puffing up. Fit a piece of aluminum foil loosely over the pastry, then put pie weights or dried beans in the pan. Refrigerate the pastry for 1/2 hour. Place the tart pan in the oven and bake for 35 minutes. Remove the pan from the oven and lift out the foil and weights or beans. Return the pan to the oven and bake until the crust is golden, about 10 minutes. Meanwhile, finish preparing the filling: Add the eggs and Parmesan to the cooled tomato sauce. Taste for salt and pepper and mix very well with a wooden spoon. Remove the tart pan from the oven, leaving the oven on. Let the crust cool for 15 minutes, then pour in the prepared filing. Bake the tart for 20 minutes longer. Remove the pan from the oven and let the tart cool for 15 minutes before transferring it from the tart pan to a serving dish. Slice the tart like a pie and serve it with the fresh basil leaves. * You of course don’t have to use this recipe for the crust, especially if you have your own favorite that you use. And if you dislike making pie crusts, store-bought can also be used. notes: I’ve made this tart many times and I have a few suggestions. First, reduce the tomato mixture as much as possible, or it will be too watery. Secondly, I use 3 large eggs and one extra egg yolk. Thirdly, I’ve always had to bake this tart for at least 15 minutes longer than it says in the directions. awesome! and your plates are soooo elegant! It’s really like a good tomato sauce in a pie crust. Not quite flan-ish. Now this is something I have never tasted but am willing to try. Thanks for your instructions. Beautiful! I like this very much, never would have thought of it! me, too! it’s very good! Tomatoes have always been on my list of “icky” foods…I do love a good tomato sauce, though, so this actually sounds really delicious to me! What an interesting dish! Really!!! It’s always funny to me what people don’t like. But thank goodness you like tomato sauce, because this is like tomato sauce in a crust. I’ve never had something like this, but it sure looks good! I wonder why the tomato sauce shouldn’t be stirred while cooking? Mr. Bugialli is pretty intense, in my opinion, so maybe he thinks lifting the lid alone will allow too many flavors to evaporate? No idea. Wow, what a beautiful tart, I love it. I love that you used tomato sauce, it’s like a pumpkin pie but savory and with tomatoes. That’s the texture I was trying to convey – pumpkin pie!!! This looks wonderful and unusual! I make Bugialli’s porcini mushrooms tart and that’s also wonderful..
ooooohh, the mushroom tart sounds divine! Thank you so much!!! And congratulations once again on your baby girl!!! What a great idea. I know it’s easy to say in the world of blogs, but I WILL actually be making this! Thanks Mimi. Funny! I know what you mean. You’ll have to tell me what you think!!! That’s a really interesting take on a tomato tart, definitely one to try, thank you! I know! I’ve never come across anything like it before! It tastes like good tomato sauce! With the texture of pumpkin pie. What a fun recipe, Mimi! I’m going to have to try this – I can see eating it on a fall day!